The age of trillion-dollar deficits is well over. For now. Thanks to a recovering economy, spending restraint and higher tax receipts, the Congressional Budget Office now projects the deficit for 2014 will be $514 billion, or 3% of the size of the U.S. economy. As a share of gross domestic product, that represents a nearly 27% drop from last year, and marks the smallest deficit since 2007. In its latest budget and economic outlook, released Tuesday, the CBO also projected that the 2015 deficit would reach a low for the coming decade, at $478 billion, or 2.6% of GDP, and then stay below 3% for a couple of years after that. But then the downward trajectory ends. 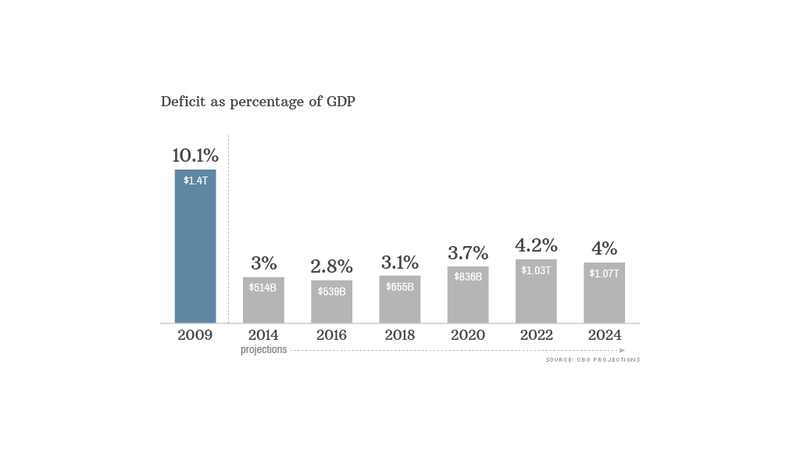 Deficits will again top $1 trillion starting in 2022, and be at or above 4% of GDP, according to the CBO. The reason? Revenue will keep pace with economic growth but spending will exceed it. All other federal spending except that on entitlements and interest, meanwhile, is projected to reach its lowest point as a percentage of GDP since 1940. Overall, the CBO expects $7.9 trillion to be added to the nation's cumulative public debt over the next decade. That's $1 trillion higher than CBO's projection last May, in part because of changes in the agency's economic forecast -- specifically lower projections for real economic growth. In any case, the debt is now expected to grow from roughly 74% of GDP this year to 79% by 2024. Historically, that's a high level. In 2007, total public debt was just 35%. And looking ahead, under current policies, even though revenue would reach historically high levels of GDP, it would not keep pace with the growth in spending. As a result, the CBO expects debt to reach at least 110% of GDP by 2038. CBO's debt and deficit projections could be higher, however, if Congress decides to spend more than the levels established by the Budget Control Act of 2011, which created the spending cuts known as the sequester. And the same is true if lawmakers make tax changes that reduce revenue going into federal coffers. From lawmakers' perspective, however, the projected drop in deficits for the next few years relieves pressure on them to address entitlement and tax reform. Indeed, there is little appetite left in Washington for the so-called grand bargain. "We predict today's good news on red ink will make it virtually certain that no entitlement reform will occur until after the 2016 election," said Greg Valliere, chief political strategist for the Potomac Research Group. Treasury Secretary Jack Lew, speaking at the Bipartisan Policy Center on Monday, acknowledged talks on closing the longer term budget shortfalls aren't imminent. "We have a little time to deal with the long term."